Here are the Rogers City Seniors from left to right: Jordyn Schalk, Jazmyn Saile, Hannah Fleming, Kayla Rabeau. 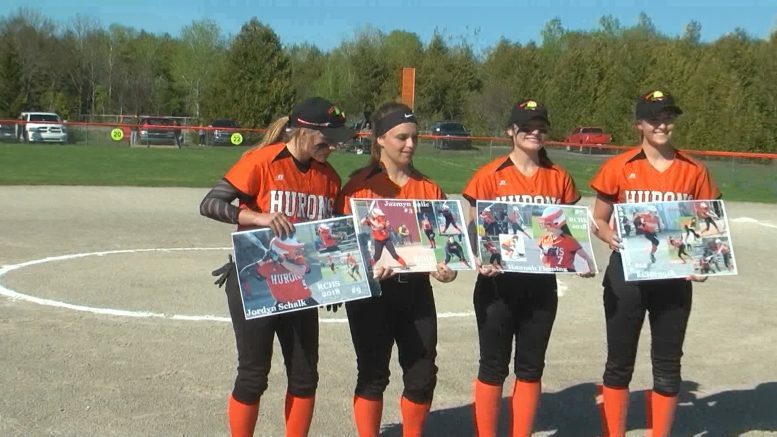 SOFTBALL: The Rogers City Hurons softball team continues to dominate league play as the ladies lock in another North Star League title by sweeping the Whittemore-Prescott Cardinals on Thursday afternoon. The ladies did what they do best and put on a hitting showcase on their senior night as one senior hit her first home run of the season on her special day. Rogers City is now 18 and 2 on the season. With no more league games left, this is their 4th straight league title. “Extra Innings” Final Results: See The Winners For Top Play Of The Week!